Hemidesmus Indicus (Anantmool) is a perennial climber found throughout India, and more commonly in the eastern and southern parts of India, up to an elevation of 900 m. The leaves and roots, with emetic, expectorant, and antidyscntric properties, are considered a substitute for ipecacuanha. The use of the plant was initially regional, confined only to areas where the plant grows. Later, interest in the plant grew through the work of Dr. Kotak and Dr. Shivpuri, who showed that consumption of just 3-6 leaves of Hemidesmus Indicus had prophylactic action lasting for several weeks, and the use of the plant became more widespread. The leaves are used as a household remedy for asthma, bronchitis, and whooping cough. 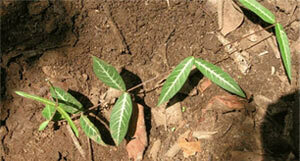 The leaves contain several alkaloids (0.2-0.4 percent) of which tylophorine (0.1 percent) is the major alkaloid. In addition, there are sterols, a-amyrin, flavonoids, quercetin and kaempferol, tannins, glucose, calcium, salts, etc. Extracts and alkaloids from the leaves of Hemidesmus Indicus have been shown to have antiasthmatic, bronchodilatory, anti-inflammatory, antiallergic, and immune suppressive properties. The alcoholic extract and total alkaloids of Hemidesmus Indicus leaves have shown an antispasmodic effect in isolated tissues and bronchodilation although inhibiting bronchoconstriction in guinea pig ileum. Aqueous extract of Tylophora indica (Hemidesmus Indicus) leaf powder and tylophorine, the major alkaloid, have shown an antiallergic effect and have modified the Schutz-Dale reaction in animals. In addition, the aqueous extract caused leucopenia indicating an immunosuppressive effect. The antiallergic effects have been confirmed by lung perfusion experiments. Tylophorine has also shown significant anti-inflammatory effect in several models of inflammation in rats. In vitro, the total alkaloids (0.1 ug.ml-1) prevented the mast-cell degranulation produced by diazoxide at dosages similar to disodium cromoglycate. Tylophora indica appears to stimulate phagocytic function although inhibiting the humoral component of the immune system. Tylophora alkaloids also inhibit cellular immune responses when administered at any stage of the immune response. A preliminary clinical study on 56 patients with bronchial asthma and allergic rhinitis showed that there was a marked relief in 40-50 percent of the patients for a few weeks after ingestion of only 3-6 leaves, the dose being 1 fresh green leaf chewed and swallowed per day for 3 days. If the patient improved, no further leaves were given and the condition of the patient was monitored for 12 more weeks. Otherwise, leaf administration was continued for 3 more days, and in recalcitrant cases patients received leaves for 12 days. An initial observation was made that the magnitude of relief in symptoms experienced by the patients was dependent on the intensity of side effects like sore mouth, loss of taste, vomiting, etc. This apparent correspondence between intensity of the side effects and the magnitude of reduction in symptoms was not borne out in subsequent trials. Following these initial trials, further open and double-blind crossover trials were performed that too showed significant beneficial effects of Hemidesmus Indicus in asthma. In a double-blind study, 135 cases of bronchial asthma were included and categorized into three groups depending upon the kind of asthma as seasonal, irregular, and perennial. Patients were randomized into each category and given either drug or placebo in two divided doses for 6 days. Of the 135 patients 71 were treated with dried-leaf powder of Tylophora indica and 64 with placebo. The drug consisted of shade-dried and powdered Tylophora indica leaf (200 mg), spinach leaf shade-dried and powdered (160 mg), and glucose (40 mg), whereas the placebo contained spinach leaf shade-dried and powdered, and glucose (340 mg) and ipecacuanha (60 mg). Improvement was assessed based on the reduction in signs and symptoms, reduction in the need for bronchodilators and steroids, and improvement in forced expiratory volume (FEV) and peak expiratory flow rate (PEFR). On evaluation it was found that the results were not statistically different except in the perennial group where there was a significant response, as compared to the placebo group, at the end of the 2 weeks. However, the question arises whether the use of ipecacuanha in the placebo group led to similar results being obtained in the drug and the placebo groups, since ipecacuanha is used as an expectorant. The efficacy of Hemidesmus Indicus was evaluated in two cross-over double-blind studies, one against placebo and the other against standard antiasthmatic drug containing ephedrine hydrochloride, theo-phylline, and phenobarbitone sodium. There was no significant difference in symptoms with the leaf compared to the standard asthmatic drug. In comparison with the placebo, the leaf showed a sustained rise in maximum breathing capacity, vital capacity, peak expiratory flow, and flow rate. There was also a significant reduction in nocturnal dyspnea. In a trial to evaluate the physiological basis of the therapeutic effect of Hemidesmus Indicus in bronchial asthma patients, lung function tests, levels of 17-ketosteroids in urine, and absolute eosinophil levels were compared in 18 healthy and 11 bronchial asthma patients before and after the administration of Tylophora. Lung function tests included tidal volume, vital capacity, timed vital capacity, compliance, maximum ventilatory volume, and peak expiratory flow rate. Lung function tests were carried out in normal and asthmatic patients immediately after the intake of 10 mg isoprenaline and on the seventh day after two 100 mg capsules of Tylophora dried-leaf powder had been taken twice daily for 6 days. It was found that there was significant improvement in lung function tests in bronchial asthma patients. In addition, 17-ketosteroid levels increased and total eosinophil levels decreased as a result of Tylophora indica (asthmatica) intake. In another double-blind cross-over study, 50 allergic rhinitis patients were given either capsules of Tylophora indica (250 mg leaf powder) or a placebo (250 mg lactose). Patients received 1 capsule per day for 7 days. This was followed by a washout period of 5 days, then a cross over to the other capsules. Although Tylophora produced a significant reduction in the sneezing and nasal obstruction when compared to placebo, there was no significant difference between Tylophora and placebo regarding subjective feeling of nasal stuffiness, nasal smear, and response of nasal mucosa to antigen. The authors suggest that a higher dosage of 1 capsule twice a day for a longer period of a fortnight, after which the dose could be reduced, may be more effective. In clinical trials, where a fresh leaf of Tylophora indica (Hemidesmus Indicus) was chewed, approximately 53-75 percent of patients reported side effects, such as nausea, lasting for a few hours. Sore mouth due to vesicant effect of the leaf and loss of taste for salt was for a longer duration and lasted up to 3-4 days after the last intake of leaf. However, the frequency of side effects came down to 16.3 percent with the intake of the alcoholic extract of Tylophora indica. Risk-benefit analysis and the lasting relief obtained by very small doses were considered to compensate for the side effects seen.